When Graeme and Wendy Evans from Evans Transport required a Logging Trailer in a real hurry for a new plantation contract, they turned to the nimble team of Panus Semi-Trailers who quickly assembled a team to design and deliver a sure-fire solution on time and on budget! The contract that Graeme received incorporates the short-haul transfer of logs within the “Green Triangle region” of South-West Victoria using a single tri-axle logging trailer. The key to the project success involved a teamwork effort that included Panus supplying the skeletal trailer and involving their Melbourne based dealer D’Angelo and their skilled team to add the Logging Bolsters and accessories supplied by transport expert Elphinstone Engineering. The Panus Skel itself is an extremely strong specification that incorporates slightly thicker flanges and chassis beams which makes its slightly heavier that some of the other skel models available. Being a short haul contract however, tare weight wasn’t an issue and in fact, when carting logs through the tough rugged terrain around the Portland region, the stronger the trailer, the better the outcomes. Giulio D’Angelo, whom has over 30 years industry experience, proved that he and his workshop personnel are more than just a supplier of turntables and parts. With less than 10 working days to complete the project, they not only fitted all the necessary bolsters and winches, they also engineered and fabricated an extension on the trailer that allowed the mounting of the cab guard on the trailer itself, thus giving Graeme flexibility to change prime movers at any time. Giulio also saw the potential of future-proofing the trailer for Graeme by positioned all the winches just below the top flanges of the trailer, allowing it to be still used as a general-purpose skel should work requirements change. With the bolsters being “clamped” to the trailer, it makes it easier to attach them on and then take off as required. Graeme was particularly impressed when he turned up to D’Angelo on the Saturday morning to pick up his new trailer, ready to go to work that Monday morning. The trailer which has already been hard at work ever since is well-supported, thanks to its use of locally supplied components including the Hendrickson owned Watson & Chalin axles and suspensions, Wabco brake systems, Lucidity LED’s and other specified components from Jost. 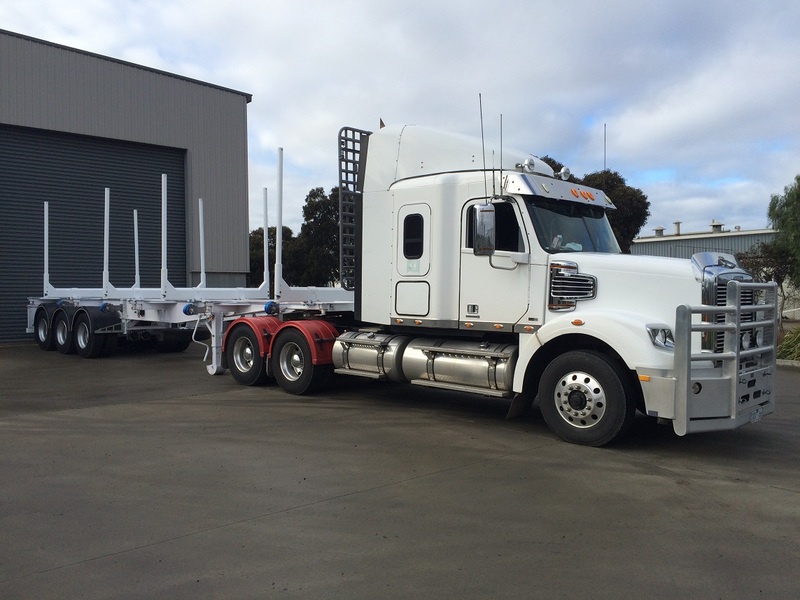 “Thanks to our dealers such as D’Angelo, K&J Trucks Coffs Harbour, Express Engineering Dubbo and Intercontinental Spares Shepparton, we’ve got trailers working across Australia and customers to date have been really happy with the quality of the trailers and the service to date.” Joe explained.